I eat this every morning with some granola and love it. It is one of the few items that is always in my fridge. 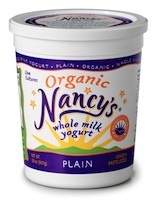 If you like the tang of yogurt, this product is perfect for you. Sweet, tart and perfectly creamy. This yogurt looks delicious and sounds it too. Where have you found this yogurt? I love this yogurt! I am a firm believer in yogurt = good health. And, yeah, while most yogurts can get boring, this honey kissed treat never does. Really good; love it w/fresh berries or sprikled with cinamon. I add a little agave nectar if I want it sweetened. A wholesome and nutritious way to get that calcium that we women need! Yummy with a bit of organic maple syrup and Organic Granola !!! I also love it with fresh fruit and granola! Or use it to make cream cheese... MMmmmmm. It's so good and good for you!